The cheerful, bubbly actress does a mean turn as villain, feels Savera R Someshwar. We seem to have underestimated a talented actress, or maybe Juhi Chawla did. That could be why she, at first, didn’t want to essay the role of Sumitra Bagrecha in Gulaab Gang. As the corrupt politician, who plays master puppeteer in the game of politics, Chawla is so much at ease that it is, frankly, a little frightening. Sumitra Devi, the widow of a politician whom she refers to as Dhartiputra in her speeches, has no compunction using the twin mantras of money and satta (power) to win the coming election. With a smile that veers on the chilling, and eyes that convey volumes more than her words do, Sumitra Devi is a politician who won’t allow anyone -- be it a policeman, a party leader or a long-time aide -- forget that everyone has to kowtow to her. But then, this movie is not supposed to be about Sumitra Devi. It is about Rajjo, a feisty woman who won’t brook any wrong. Beaten and tortured as child because of her passion for education, she has over the years become a savior for the local women. She runs an ashram, where the dress code is pink, where little girls are taught to read and write and women to fight and generally stand up for what is right. The villagers revere her as Didi and turn to her to solve their problems. So, when a corrupt collector stalls the electricity connection to the village because he wants a hefty bribe, the headman asks Rajjo for help. The collector, who is salivating at the prospect of money and maybe a little nookie on the side, won’t budge. A thirsty Rajjo asks for water, and rolls the cool steel glass across her face. It’s a sign that she’s tired of talking. She walks out, the Gulaab gang approach begins and the ladies in pink wait around a bonfire for their solution to take effect. As they wait, they burst into song. And that is where the film begins to fail. Songs can enhance a film or serve as jerky barriers to the narrative. In Gulaab Gang, their placement is inappropriate. Madhuri Dixit is a fantastic actor and the role of a strong minded rural woman who is willing to fight for her rights is not beyond her. Do watch her in Mrityudand and you’ll know what I mean. Here, she is saddled with a flawed script; something that she is not able to rise above. Rajjo is supposed to be an aggressive, strong woman who faces many difficult situations armed with her self-belief and her determination to battle what she thinks is wrong. But her reactions don’t ring right. Her anger, her grief, her bafflement are all inadequate. The confrontations between Rajjo and Sumitra Devi should have been impactful, with the resounding echo when two strong personalities clash. Sadly, they don’t. These are major drawbacks that bring down a potentially good film. 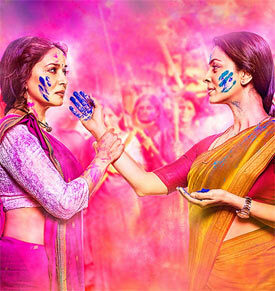 Gulaab Gang is director Soumik Sen’s debut, based on a story he has written, and he has clearly worked hard on the film. Unfortunately, taking on the responsibilities of screenplay and dialogue as well have worked to the detriment of the director. Also, for a film that is about women who have risen above their harrowed circumstances to help society, Gulaab Gang film has a glaring, irredeemable flaw. The makers claim it is a work of fiction. Yes, there are fictional elements but the kernel and the tale, clearly, is Sampat Pal Devi and her Gulabi Gang. She deserved a bow. If Sen felt shy of acknowledging her inspiration at the beginning of the movie, she should have at least been mentioned in the honour roll of women who have taken the poor cards life dealt them to empower other women. Ignoring her, if I may say so, smirks of arrogance and is in bad taste. Actually, since Sen is so clearly inspired by her, he could have infused Rajjo’s character with exactly Pal’s brand of aggressiveness. And then, maybe, he would have a hit on his hand. Meanwhile, you could watch this movie for Juhi Chawla. She is a revelation and we really hope the film industry takes notice! And for Divya Jagdale and Priyanka Bose who stand out with their performances. Take a bow, ladies!